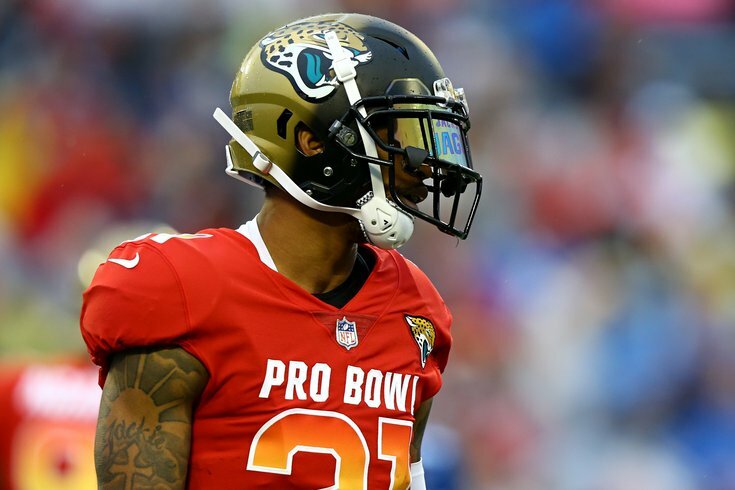 The Jags will be without Pro Bowl cornerback A.J. Bouye. One of the rare teams in the NFL that even come close to matching the Philadelphia Eagles' injury woes this season is the Jacksonville Jaguars, who will be without quite a few starters this Sunday in London. Here are Eagles-Jaguars inactives, with analysis. To note, the Eagles are late announcing their inactive this week, so we'll rely on Derrick Gunn, who is on the field, for the time being. • CB Sidney Jones: Jones suffered a hamstring injury against the Giants that will keep him out a while. The Eagles signed Dexter McDougle five days before their matchup against the Panthers, and then he "started" in the slot. We'll see if the Eagles keep that same secondary configuration. • RB Darren Sproles: This will now be the seventh straight game that Sproles will miss, though I'm sure Doug Pederson expects him to return to the field "soon." • S Corey Graham: Graham injured himself during the Vikings game. The Eagles remain thin at safety. • LB Nathan Gerry: Kamu Grugier-Hill won the WILL job over Gerry, so Gerry's loss won't affect the regular defense, but Gerry is a core special teams contributor. • OT Jordan Mailata: Mailata is back down after dressing for the first time in his career last week. 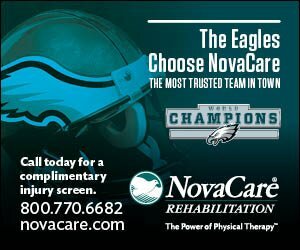 • OT Matt Pryor: Pryor is the 53rd guy on the Eagles roster, as he was the lone healthy scratch last week against the Panthers. • DE Derek Barnett (IR): Barnett had shoulder surgery, and his season is over, Doug Pederson confirmed on Wednesday. Barnett was the starting RDE who was off to a fast start this season, collecting 2.5 sacks (including a game-ending sack against the Indianapolis Colts), before suffering a shoulder injury against the Tennessee Titans. He played two games through the injury, but was much less effective than when he was fully healthy. Michael Bennett will almost certainly take over as the new starting RDE, with rookie Josh Sweat likely to see an increased role as a backup. • RB Leonard Fournette: Fournette is a former No. 4 overall draft pick who has missed most of this season so far with a hamstring injury. The Jaguars have attempted to build their running game around him, with mixed results. In his two-year career, Fournette has 288 carries for 1040 yards (3.9 YPC) and 9 TDs. • CB A.J. Bouye: Bouye is a starting corner, and a very good one. In 2017, he had six INTs and 18 pass breakups. In 2018, he has 1 INT and 5 pass breakups. The Jags will likely be down three corners in this game. • CB D.J. Hayden (toe): Hayden took over as the Jags' nickel corner for the departed Aaron Colvin, but he has only been able to appear in two games this season. The Eagles could look to get slot receiver Nelson Agholor more involved in the offense against Jacksonville. • CB Tyler Patmon: The Jags' corners are further depleted with Patmon down. He had been filling in for D.J. Hayden in the slot. • TE James O’Shaughnessy: As you'll read below in the "Notable players on IR/Suspension/Other" section below, the Jags are already without their top two tight ends. O'Shaughnessy is TE No. 3. Prediction: The Jaguars' offensive game plan will not revolve around their tight ends. • DE Dawuane Smoot: Back of the roster guy. • DT Eli Ankou: Ditto. • LT Cam Robinson (IR): The Jaguars lost Robinson, their starting LT, for the season with a torn ACL. Filling in for him initially was Josh Wells, who then injured his groin. The Jags placed Wells on IR, and signed former Giants bust Ereck Flowers. • OT Josh Wells (IR): See the blurb on Robinson above. • WR Marqise Lee (IR): In 2016, Lee had 63 catches for 851 yards and 3 TDs. In 2017, he had 56 catches for 702 yards and 3 TDs. In 2018, injured his knee during the preseason, and his season is over. • TE Austin Seferian-Jenkins (IR): Seferian-Jenkins had surgery to repair a core muscle injury, and was placed on IR, though his season isn't necessarily over. Before he went on IR, Seferian-Jenkins had 11 catches for 90 yards and a TD, and he was a good blocker in the run game. • TE Niles Paul (IR): Paul was Seferian-Jenkins' backup. He had 10 catches for 98 yards on the season before he suffered an injured MCL. • RB Corey Grant (IR): In 2017, Grant made a lot of plays for the Jags in limited opportunities, rushing 30 times for 248 yards (8.3 YPC) and 3 TDs. He suffered a Lisfranc injury to his left foot, and went on IR. As a result of Fournette's nagging hamstring injury and the loss of Grant, the Jags traded for former Browns RB Carlos Hyde.